Burgundy is located in central France and is noted as one of France’s great wine regions. We arrived at Paris Charles de Gaul airport and made out way into the city to the Gare de Leon train station, where we boarded a train to Dijon. This was where we had arranged to pick up rental bikes. They representative from the rental office was there waiting for us, when we arrived and we were soon on our way again on a local train to our final destination. 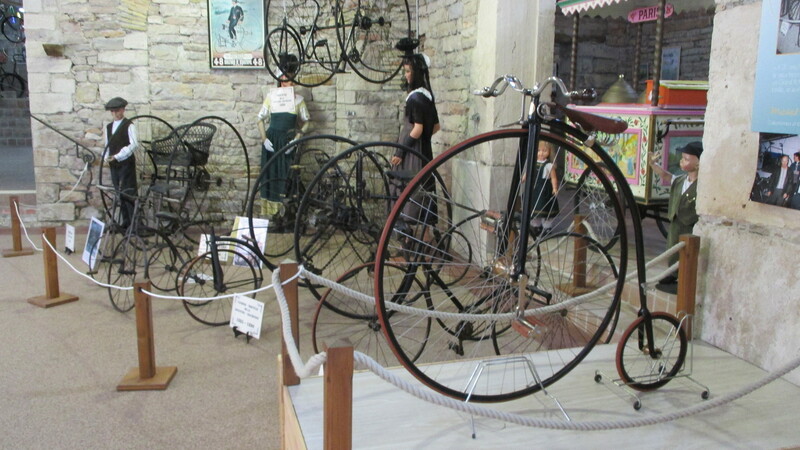 We arrived at Chalon-sur-Saône, where we would begin our ride the next morning. This mid sized city in on the shores of the Saône River. This region has some dedicated cycle routes, which is a nice feature. We headed away from the rail station over the tracks on a pedestrian and cycle bridge and up a hill on the roadway and before long we were on a cycle path (Voie Verte). This is a nice wide, paved path; much of which is part of a disused rail line. We pass by a number of old stations that have found new use for shops, homes and tourist information stops. As we weave our way past the offset wood barriers on the path; making it safe for cyclists, we pass by farms, fields, woods and some towns. After about 24km, we see our first vineyards of this tour. The day had started with rain; but, by midday, the sun had come out and it was beautiful. We turned off and joined the stream of traffic on the road through Cormatin. 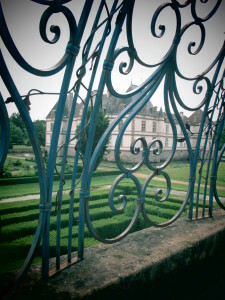 This pretty little town was a good stop for refreshment, as well as a nice visit to the Cormatin chateau and grounds. Then we were off, on the same busy road, until we pass over the La Grosne river and at the intersection, after, we continue right and then left to re-join another dedicated path. There is another disused rail station at Massily, which now appears to be a shop with ice cream. 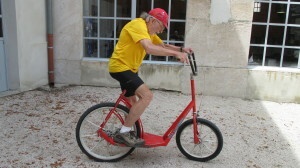 We pedal on and the final approach to Cluny is on the roadway. We make our way through the narrow streets up into town and hurry to visit the famous Abbey and other sights, before a wild afternoon thunder storm hit. 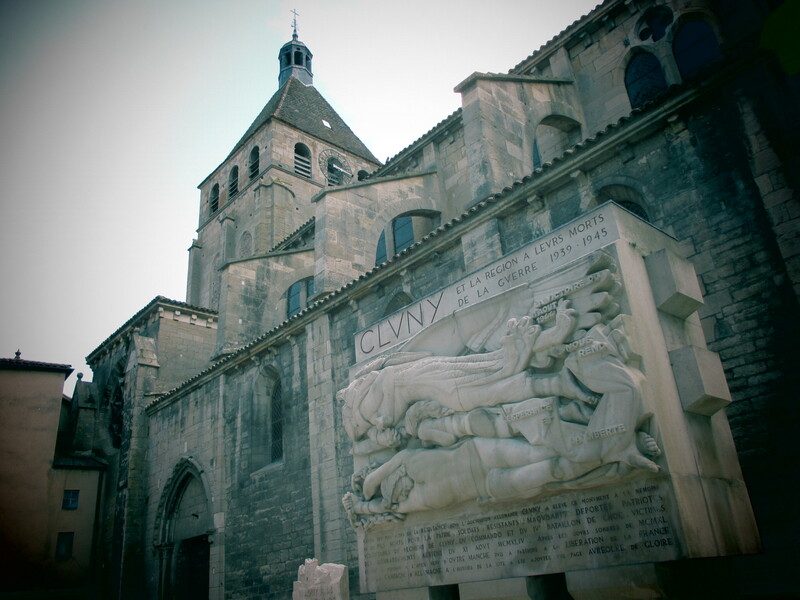 Cluny’s Benedictine monastery once controlled over 10000 monks from Poland to Scotland. Although the remains are only about one tenth of the original, this is still very impressive and we lingered over the exhibits while the rain poured outside. Today’s ride has a few little hills; but, mostly flat. The countryside is really beautiful; varying from woods to fields to vineyards, along the way. We are mostly away from the highway, with just a few sections where the trail is beside; but, separated. We rode past the abbey and cathedral on our way out of town the next morning. Then on pass part of old city wall and over the Pont de La Levee stone bridge; down the road and into the countryside. 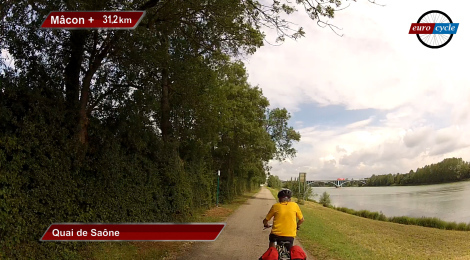 After about 2km we make a right turn onto the Voie Vert path. The trail is easy to follow and soon we are crossing over rail tracks on the bridge path. Then we pass under the busy N79 highway. It is so nice to be on this dedicated path. After about 8km riding, we arrive at the du Bois Clair tunnel. This disused rail 1.6km tunnel takes about 10 minutes to ride through and is paved and lighted. There are doors at either end, as it is closed in the winter as habitat for bats. This was quite the experience. Throughout today’s ride, the Voie Vert periodically crosses over the roadway and continues on the other side. Soon we are beside the first vineyards of today. After about 23km from the start, we cross the D54 and onto a section of a about 1.5 km that had not been paved, at the time of our trip. This was the only unpaved section we encounter; but, it was rutted dirt, mud and gravel, so the going was slow. We were glad to reach a paved roadway at the end of this stretch. From here we are on the roadway until we get to central Mâcon. We ride under a rail underpass at about 27km and then a roundabout. After the roundabout, we are treated to a bike lane in the road. We follow along Rue Gambetta and make our way to the Soane river promenade at L’esplanade Lamartine. This July afternoon was rainy, so there were not many people out; but, this was a nice scenic ride beside the river to the crossing for our hotel. We checked in, dried off and headed into the center to sight see a bit. There are some interesting old buildings and pedestrian streets. 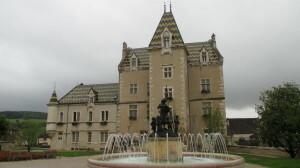 Mâcon and the region surrounding is noted for its wines; mostly white. 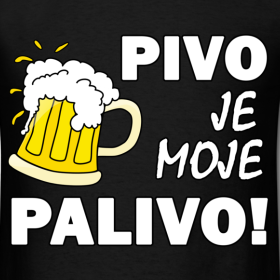 Do give it a try. Sad to say that our remembrance of this town was not what it might have been, had the sun been shining. That definitely changes one’s perception. Nearly the entire day will be along the Saône River, with only one short diversion. It was an easy exit from Mâcon. We simply crossed the road and headed down the promenade, beside the Saône river. This is Quai Jean-Jaures. At the end, we split off onto Allee du Parc on a bike lane that parallels the river. We pass by a marina and then on a dedicated, paved Voie Bleue path and just a few small roads. We pass under a a highway bridge and past fields of crops; but, no grapes. The river is in and out of view. At Fleurville, we path crosses under the bridge. Then at about 23km, there is a camping sign and we stay on the dirt track, next to the river. Then we pass under another bridge and at about 24km, there are a few cobbles and dirt for about a kilometer. At about 27km, we turn off left on dirt and away from the river. This takes us through a short tunnel under the rail tracks and then a right turn onto a small road and up to ride through Le Villars. This is our climb of today, till we reach Tournus. Turning left out of town, we glide downhill and back beside the rail tracks. Then, we ride through another short rail underpass and we are again beside the tracks. It is straight on and then we pass another rail underpass; but, just keep going. The trail curves right and we are soon back on the path beside the river. 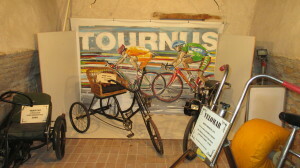 This will take us the rest of the way on Quai de Saône, under the Tournus auto bridge and on past the Tournus port. 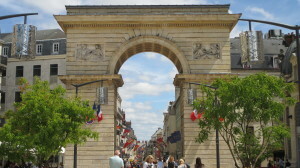 At the low bridge into town, we take a left, instead of crossing, and wind through town to the busy Avenue Gambetta, where our hotel is located. The sun was shining brightly and we were anxious to head out and see the town. Tournus has the very best bike museum we have seen. 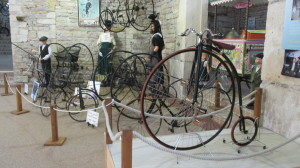 It is on the edge of town and is a warehouse of memorabilia, including some fascinating bikes you can actually try out in the courtyard. Don’t’ miss this. The town itself, has some classic old buildings and the towering St Philibert abbey dates back to the 10th century. 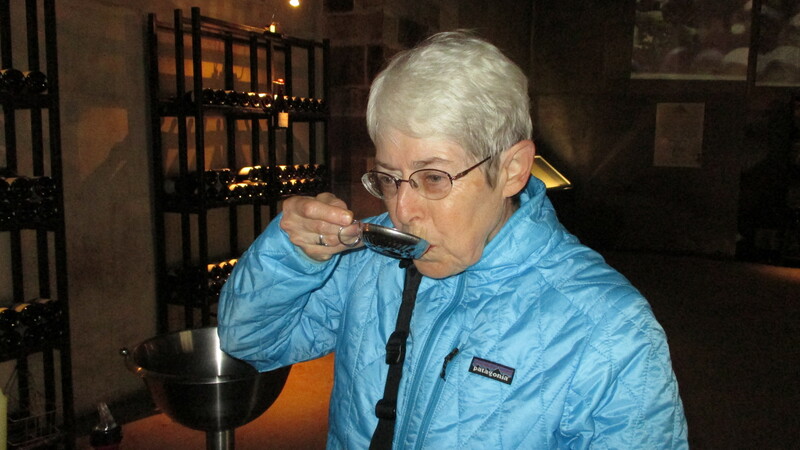 Of course, there are more wines to taste, as well. Today’s ride is not an official route; but, one we devised on our own. Very little in on bike lane or path; but it does take quiet country roads and is an easy way to Chalon. We leave our hotel, cross Avenue Gambetta and head down toward the river on Rue Saint Laurent. At Rue Rene crossing, we turn left and then right onto a smaller road in just over a kilometer. Just ahead we reach the river path and turn left beside the Saône, once again. This section is paved; but, others are dirt. About 3.5km from our start, we turn left, away from the river. The path gets rougher and there are sections of dirt farm road with the two tire tracks to follow. There is paving ahead. 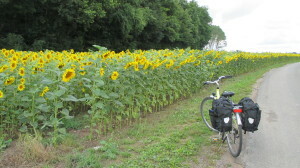 We pass farms, crops and also massive fields of blooming sunflowers on this July day. No sign of grape vines today. The road names change; but, we just keep following one small country road after another; some paved and some only dirt tracks. We pass through the town of Reppe au Prost and pass by the church and the big water tower, on the way out. More sunflowers ahead, as well as more crop fields and some woods. After about 17.7 km we turn right onto the busier, lined D182. There is no bike lane. Then we make a left onto the D6. The road names change as we continue on and ride through both Varennes le Grand and St Loup de Varennes and on through Lux. We leave Lux on Rue de Saône and meet the river at Rue de Guillot, where we turn left to ride beside ther river all the way into Chalon. This path is very rough in places and parts are just meant for local access; but, this is a good back way into Chalon. We pass under a bridge keep going. Soon we are in the outskirts of town and we are on a welcome paved path beside between the roadway and river. We pass under a rail bridge and turn off left to cross the road on Rue Sebastapol to ride up into town on an actual bike lane. We ride to Avenue Victor Hugo, where we turn left and then left again to head to the rail station. We were staying close by at the same place we spent our first night in the region…. Familiar territory. We had time to stroll down to cathedral square and to do a little shopping as well as enjoying an afternoon snack in one of the surrounding cafes. Rue de Chatelet and Grande Rue have interesting old buildings. This ride will really take us into Burgundy wine country as we ride up and through the prestigious vineyards and classic villages of the region. We make our way out of Chalon, from near the rail station; Place de la Gare to Blvd de Republic; riding in the bike/bus/taxi marked lane. Then on Rue de Citadelle, Avenue de Paris and Avenue de L’Aubepin, Rue Monge and then into the suburbs. Then Avenue des Mairots and Rue des Tilleuls. This part on smaller more local access roads. When we reach Leve du Canal, we are beside a quiet canal that we will follow for about half the ride. At Champforgeul, this is officially the Canal Central on our right and we will be passing by a number of locks and slow moving boats. The trail is nicely paved and the only elevations are when we go up and over roads and then back down on the other side; staying on the path. This is really pastoral, wooded and quiet. We pass under several auto bridges, along the way. When we reach Chagny, at about 20.5km, we take the little bridge to cross over the canal and continue on the path on the opposite side. This puts us in position for a tricky turnoff in about 3km on a dirt and gravel small trail that takes us past houses at Remigny to the roadway. This actually connects us with our route. We keep right and meet the D113, where we turn left. There is no bike lane and this can be busy. We cross the D974 and there are vineyards and more vineyards. We ride across a bridge and up to the pretty approach to Santenay on the D113A. The lookout over a scene of vineyards and a photo op and just the beginning of what is ahead today. We were thankful for the wonderful paved path. There had been rain and if it were dirt, it would have been mud. 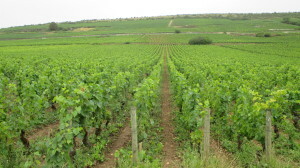 We are surrounded by vineyards for most of the way now from here to Beaune. Some are surrounded by low rock walls and along the route we pass an attractive stone beehive hut, which makes us recall those ancient celtic ones we saw in Ireland. We ride through Chassagne-Montrachet and the route is well signed with the little white signs with white bikes on green background. 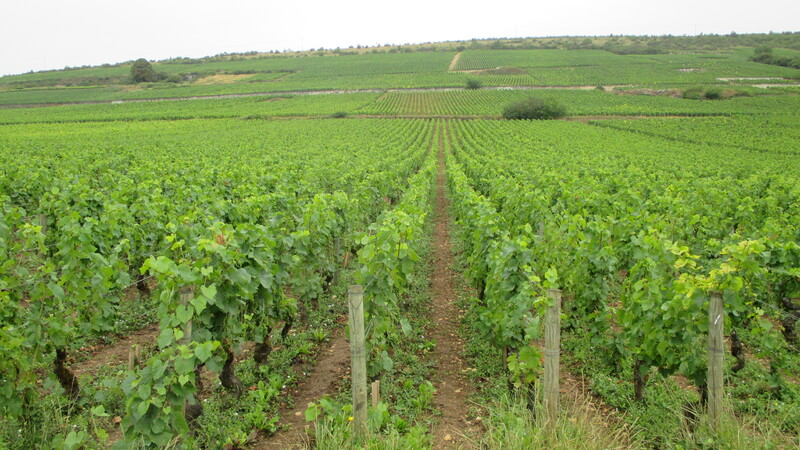 This is the Voie des Vienes through Burgundy’s Grands Crus (the best of the best) of these wines. The terrain varies, with some climbs into some of the villages; but, it is so beautiful and peaceful on this route. 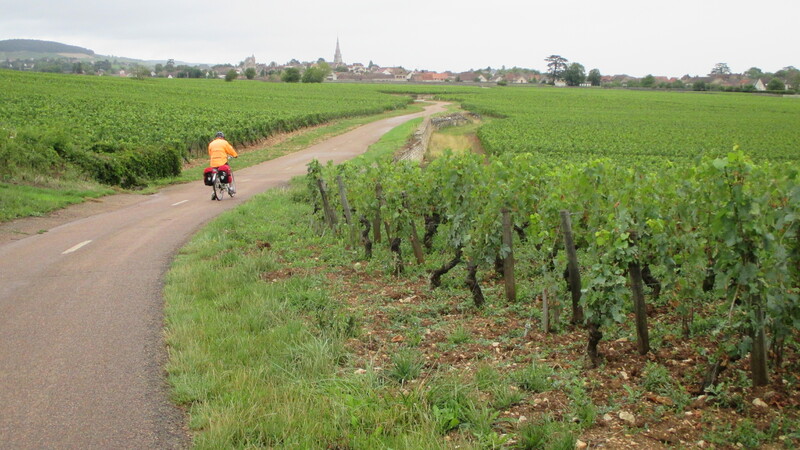 At about 31k we turn to ride through Puligny-Montrachet. The stones of the walls are reflected in the construction of many of the buildings as well. We are now on the D113B, following route signs as we leave town and climb up and then coast down. We see another town ahead and aim toward the steeple. 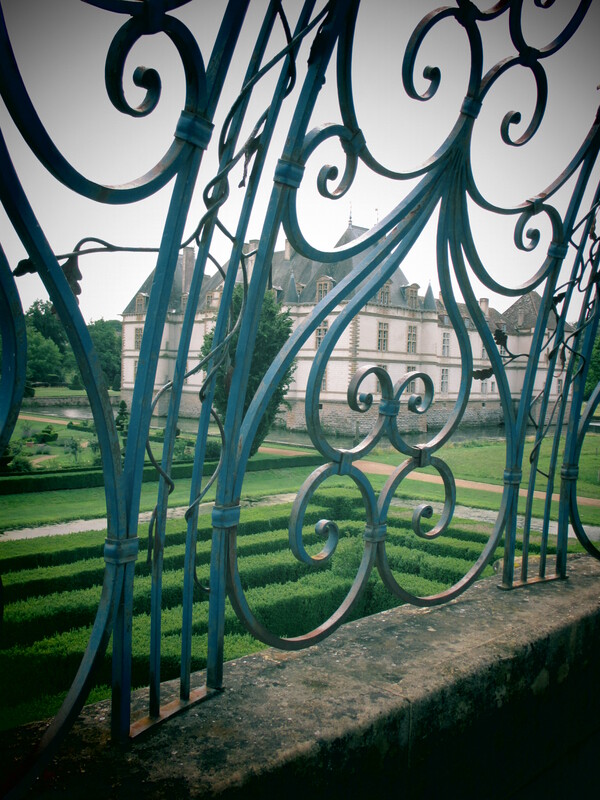 This takes us up the hill and into Meursault. This is one of the prettiest and tidiest towns we had been through. It was very welcoming, with it’s old town hall, fountain, park and surrounding shops and restaurant. 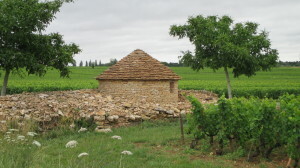 We stopped for refreshment and then followed the stone wall out of town and down amongst the vineyards once again. At about 39.5k we cross the roadway on Rue de la Chapelle and climb into Volmay, passing the church and then out into vineyards again and down through Pommard. The vineyards continue until at about 44.5k we find ourselves at the outskirts of Beaune and maneuver a few streets until we locate our hotel, which was just outside the city walls. 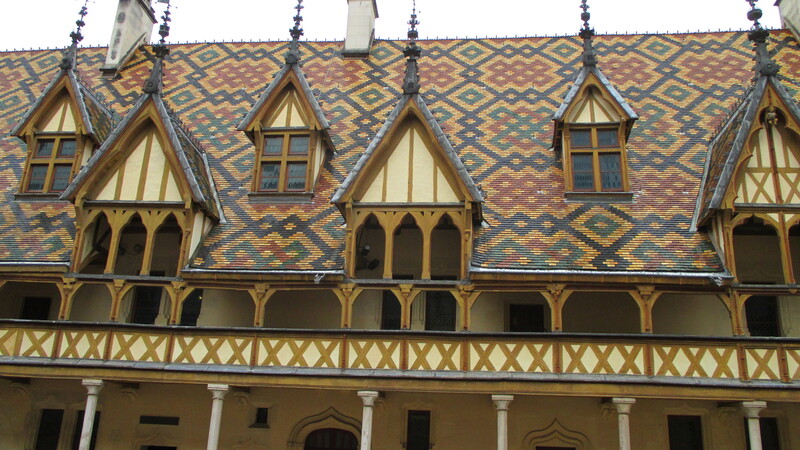 We planned an extra day in Beaune, as there is a lot to see here. 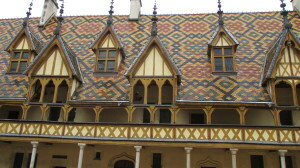 At the center is the Hotel Dieu, with it’s distinctive patterned roof. This served as a hospital from 1443 until the 1960’s. This was much needed, as the region was devastated by both the Hundred Years War and the Black Death plague, leaving more than 90% of the population destitute. Now it is a must see tourist attraction, depicting the ancient medical care. 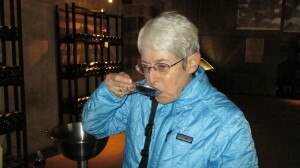 Just across the street is one of the many wine tasting and touring facilities. For a small fee, you are allowed access to tour the caves, below the shop and taste the various vintages on offer in the shop above. 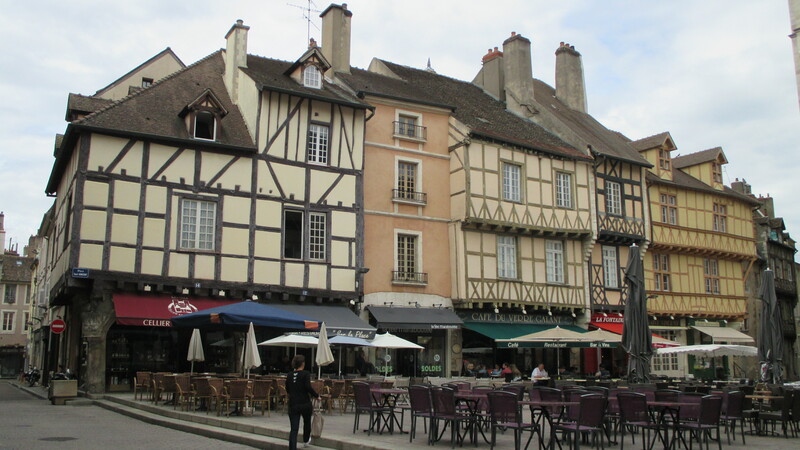 There are shops of all sorts in the town center and some of the ramparts are walkable for another view and a good way to work up an appetite for sampling the local cuisine. We followed the D974 to the intersection with the walled part of town and then a right onto D470 on a shared path. Just past Tourist Information, the designated bike path picks up and we continue for just over a kilometer, where we cross the road with the path to the right of the D470. About 1.7km from the start, we turn off right onto the smaller D20, which does not have a bike lane. This takes us out of town and into the countryside. For much of this ride, we alternated between riding beside fields and vineyards. It is still a pretty ride; but, is not as well signed as the day before. The D20 passes through a number of small villages and changes from time to time from just D20 to D20F and D20A. We reach Nuits-Saint-George on the D974. This is the largest of the towns we pass through and very pretty. We leave by turning left onto the D25. Soon the landscape is mostly vineyards at 20.5km. 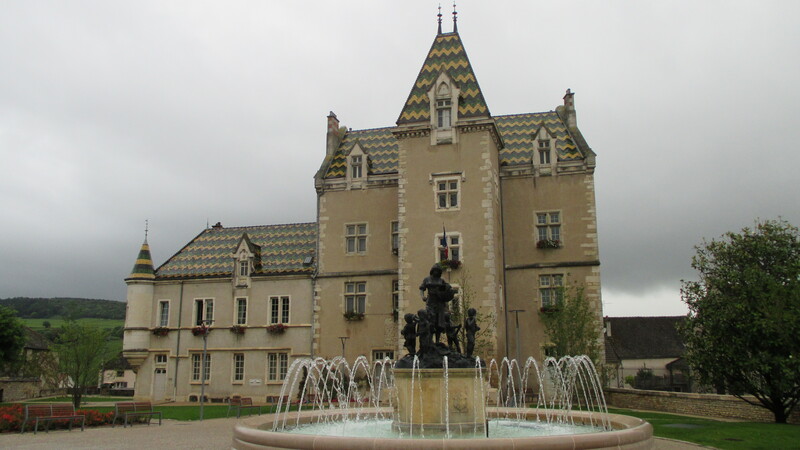 We pass through Morey-St-Denis on the D122 and then are on the D31 as we leave Gevrey-Chambertin and go through several more villages. We ride through Chenouee and are on the busier D122 once again. This is really the suburbs of Dijon, At about 42k there is a path beside the road. This is a very wide road with grassy area and tram tracks dividing each side. We are watching for the intersection, at Dijon that has a ramp for bike and leads up beside the rail tracks. We are nearly at our final destination. We follow various one way roads till we reach Rue du Docteur Albert Remy and the station at Place Darcy. 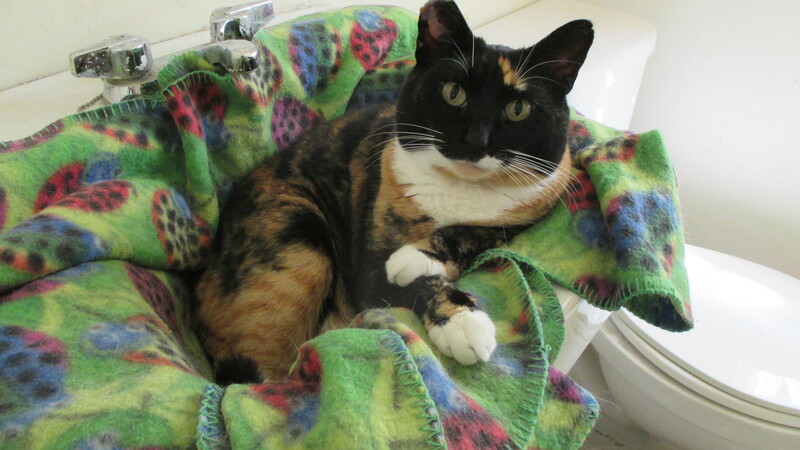 We are staying nearby. Dijon is a large town, with lots to see. There is a pedestrianized shopping area, museum and park within easy walking distance.